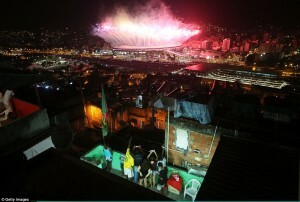 Have you wondered how Brazil would execute Olympics this year and generate enough space to create this extravagant event? In order for Olympics to be built, the City Hall needed to make space for it and rebuild the Olympic park, though on the on the expense of 900 families losing their homes. The event was built next to the Vila Autòdromo favela, home to many families who had lived there for two generations. When the first settlers came to this area, close to where the Olympic park is, about 40 years ago it was a jungle. Young families moved here and built their houses from scratch. They created a community, and a home were children were raised, childhood memories created and with it, the people got a strong sense of belonging and a safe community. It was a quiet suburb, no drug dealing, stealing or rapes and close to good school and work. The 12th richest person in Brazil and real estate developer Carlos Carvalho wanted to make the Olympic park a city of the elite. He wanted to attract attention to the area after the Olympics so he could make a good income of the lands in the times after. 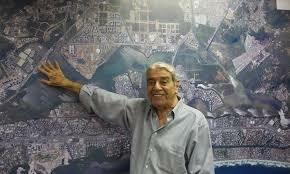 Therefore, Carlos Carvalho had an immense interest in re-constructing the area. To finalize his real estate dream- it helps to have political influences and it is especial beneficial when you are rich enough to donate money to the majors political campaigns. But, what a real estate investor do not need, is poor people, it decreases the land value. The outlook of this community does not match up to the ideas of luxury and it is in the sight of the Olympic park. 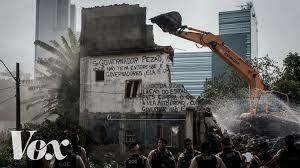 The process of demolishing the community started two years prior to the Olympic Games. Sadly for the citizens in the community of Vila Autòdromo favela, it is based too close to where the Olympic actions are going to happen and real estate investors are eager to retransform it. The now former community, Vila Autòdromo favela, was not considered to be aesthetically good looking, not a city of good taste and could not measure up to the upper class visuals community of Carlos Carvalho. The Mayor announced to demolish the community. Construction workers and machinery entered to destroy the buildings, hammered and tour it apart. Shortly after, the Vila Autòdromo favela was transformed to a construction site. But for the people there, it was still their home, nonetheless they got evicted and it resulted in separations. Some family members stayed to fight and defend their rights and the remaining’s of the community. Some left and settled to be reallocated from houses to small apartments and a few stayed. A woman who stands out is Maria De Penha, she is the local spokesperson and activist in the community. Maria advocates on behalf of the people and they formed a local group called `Residents association Vila Autòdromo. 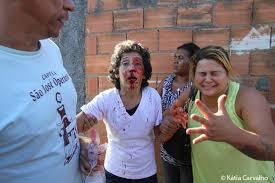 Maria, the frontfigure of the community is battling against the City Hall and the urbanization of The Olympic Games. I have found several videos of her, with Maria De Penha, bleeding from her head after police enforcements, police violence and cuffing for air after teargas attacks. Is the violence really necessary? I would instead ask an other question, do poor people or a working class town as the Vila Autòdromo favela, portray a glamorous picture of Brazil? I doubt the City Hall want to show its tourists and its global audience how the economic and social situation really is. According to government data in Brazil, there have been 77.200 removals since 2009. Logically, it is easier to hide the neglected shanty towns, hide the “ugliness”, meaning the poor towns. In order to impress visitors and tourist, some parts of the city gets a makeover. Such as the beautiful touristy beaches placed in the south. The airport is placed in the poor North, so you will have to drive past Maré, an other part considered a “ugly” city. The convenient solution was for the government to build a white wall around it, so people could not see that Maré looked like a total wreck while driving past it. With a wall they can hide the infrastructure and don’t have to rebuild it. The official report they gave, was an attempt to protect the ears of the residents due to heavy traffic. Hence, the wall was important to build to secure the hearing abilities of the citizens in that area, but school and proper sewer system? Not so much! But, what about the people living in Marè, it would be nice if they can be hidden as well. Don’t worry, the bus routes were cut, to make it much more difficult for the residents in the north to get transported to the south where the Olympic`s took place. The government built up certain parts of the city, the areas that would have the most tourists and international attention, while completely ignoring other parts. The parts where the poor live, the ones being bare foot, homeless, skinny, hungry and fatigued. Instead of investing the money in the unfortunate, it ended up in giving economic growth to private investors, who are already wealthy and privileged. It is easier for the government to beautify a small fragment of Brazil, this way, the politicians don’t have to solve infrastructural, social and economic problems as a whole, that is too much work for them. It is easier to enjoy the festivities, when you don’t have to deal with the reality- the sad and dark side of Brazil and the ruins, that would be a distraction. Therefore they pimped the area up and build a temporarily, jet a beautiful event. The tourists was “woowed” and mission complete. The result is now that Brazil spent billions of dollars on an event that would only take place once and afterwards never to be used again. Was it worth it? For many locals, the tickets were too expensive to buy and the stadium did not even get filled out! Previous post: Elitism on Campus? Very interesting article, and certainly a big topic of discussion in these recent Olympic games. There was always controversy surrounding the selection of Rio as the host nation for 2016, which begs the question, why did they bid for it in the first place? Brazil is not regarded as being a wealthy nation, and everyone knew that with all the money that goes into building the many facilities that are needed for the games, it would look bad given how the majority of the population live. Apparently the initial statement was to do host the games for about US$14 billion (bit.ly/2c0I4DT). There was drama leading up to the event as well when it didn’t look like things would be built in time, and I’ve heard from friends that attended the games that the areas seen by the cameras were quite different to those that weren’t. There have also been numerous articles which detail how old stadiums from previous Olympics have been completely neglected and abandoned (bit.ly/2btjnNG), which makes you wonder if billions of dollars from a countries economy is worth 2 weeks of tourism and the spotlight. As you said the locals couldn’t even really afford the exorbitant ticket prices, and the majority of the events (bar the football) were empty. Thank you for bringing out this story. I noticed this because I had watched a video clip about kid thefts on streets during the time of Olympic Games. I was flabbergasted. I didn’t know how much reputation Brazil government had planned to achieve from Olympic Games, but the video might ruin it all. Skinny, small thefts recklessly rode on their bikes, threading their way on streets among cars, attacking tourists, snatching their phones and bags, and of course being beaten heavily if they were caught! It shown the whole dark place of an unstable society where poor people are struggling to earn for living and uneducated children are risking their life on streets. But the same situation is happening in my country too, when some powerful people exaggerate about what-called-profitable-projects that will change the urban face to attract more foreign investments. In fact, it does cost to develop infrastructures and improve the urban plan but this improvement has to increase the social welfare as a whole. From your story, it is obvious that poor people did not gain anything but lost. Rethinking about my country, the government should be awareness that public is provoked to projects which only bring more money to rich people. It is truly sad, to deprioritize a such a big and vulnerable group of people and also very typical. For someone to be rich, we need some poor people, they only steal, because they were not given a chance to survive otherwise. This is why it is important to emphasize on the hidden truth so people learn more about life than PokemonGo for instance, especially in the western world where we are so privileged. Better welfare would reduce social problems and crime, though it is not in their culture to think so, therefore the leaders should be educated differently so they understand the complexity of their people and the consequences of ignoring them. Thank you for your thought! I like the detail you put into describing the destruction of Vila Autòdromo favela. This drew my attention not to that community only but to many other communities and various social problems in Brazil. I believe there are many more people worldwide and in Brazil discussing these issues now and looking for possible solutions. Would this happen without the Olympics?